Mar. 30, 2016: Concordia College will host a screening of the new documentary film Most Likely to Succeed on Saturday, April 16, at 7:00 pm. The film, which premiered at the 2015 Sundance Film Festival, examines the shortcomings of conventional education methods in today's changing world and features an exciting and revolutionary new educational approach that promotes so-called soft skills, which many believe are more important in today's workplace than the three Rs. Once the envy of the world, the American educational system produced an unmatched workforce tailored for the 20th century. But as the global economy has shifted over the past 20 years, the United States has clung to an obsolete education model with an emphasis on teaching to the test, thus leaving our students woefully unprepared for 21st-century employment. At a time when many recent college graduates find themselves underemployed, Most Likely to Succeed explores the causes of this phenomenon and offers up a possible solution. Interviews with education specialists, economists, business leaders, teachers, students, and parents shed light on the urgent need for a new kind of education that develops the uniquely human skills and capacities that cannot be replaced or made obsolete by a machine. The film follows students into the classrooms of High Tech High, an innovative new school in San Diego. There, over the course of a school year, two groups of ninth graders take on ambitious, project-based challenges that promote critical skills rather than rote memorization. Most Likely to Succeed points to a transformation in learning that may hold the key to success for millions of our youth--and our nation--as we grapple with the ramifications of rapid advances in technology, automation, and growing levels of income inequality. The screening will be featured in the Sommer Center for Worship and the Performing Arts on the campus of Concordia College and will include a panel discussion and question-and-answer session with the audience. The film is free and open to the public. Click here to reserve tickets: https://www.eventbrite.com/e/sluberski-film-series-most-likely-to-succeed-tickets-22114648509. Mar. 23, 2016: Noted author Colleen Oakes, a Concordia College graduate, will give a presentation titled "Imagination Rising" at Concordia's Books & Coffee event on April 7. Oakes will speak about her books, her unique publishing journey, and the role of imagination in an adult life. The event begins at 7:00 pm in the Sommer Center for Worship and the Performing Arts on the campus of the college. Oakes is the author of best-selling books for both teens and adults, including the Elly in Bloom series, the Wendy Darling series, and the Queen of Hearts series, whose first novel will be released by Harper Collins in May of 2016 and has been optioned by Universal Studios for a major motion picture. She is currently at work on a stand-alone novel and another young adult fairy tale series. For more information and to RSVP for this free event, please email CLOAKING . 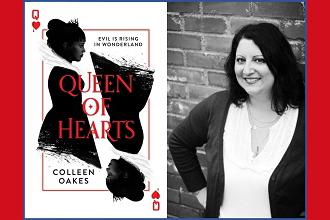 Pictured here: Author Colleen Oakes. Mar. 23, 2016: The exhibition Ellsworth Kelly Photographs, at the Matthew Marks Gallery through April 30, of over thirty gelatin silver prints of photos taken by Ellsworth Kelly between 1950 and 1982 is the first ever devoted to Kelly's photography. Kelly is best known for his paintings inspired by nature and by what he saw as chance compositions encountered in everyday life. He decided that it was not necessary to compose subject matter. It occurred naturally, and all he had to do was recognize it and paint or photograph it. Kelly explains, as quoted on the gallery's website, "'Everywhere I looked, everything I saw became something to be made, and it had to be made exactly as it was, with nothing added. It was a new freedom; there was no longer the need to compose.'" Kelly finished preparing these prints and planning the exhibition shortly before his death on December 27 of last year at the age of 92. His foray into photography began in France in 1950 with a borrowed camera. The gallery's website explains, "Unlike his sketches and collages, his photographs were never part of the process of making a painting or sculpture; they were simply a record of his vision." Many artists used so-called ready-made materials in their art. Kelly was looking for ready-made compositions to employ as subject matter. Kelly returned to the U.S. and started photographing barns on Long Island. A number of these pictures are included in the exhibition. He then focused on architectural details, such as windows, roofs, and the shadows they cast, and found inspiration for these photographs in upstate New York and France. The juxtaposition of stark, weathered barns with overcast sky behind them and small details such as corners, cellar doors, and stone work demonstrates his ability to drill down into his subjects to extract their essence, akin to still lifes. Pictured here: Two photographs by Ellsworth Kelly in the Matthew Marks Gallery. Mar. 23, 2016: As part of Concordia College's ongoing cultural programs for the public, the Hoch Chamber Music Series at Concordia Conservatory presents the Canadian Brass on Friday, April 1, at 7:30 pm at the Sommer Center for Worship and the Performing arts on the campus of the college. The program includes music by J. S. Bach, G. Gabrieli, J. Lennon, L. van Beethoven, and F. Waller. With an international reputation as one of the most popular brass ensembles today, Canadian Brass has truly earned the distinction of "the world's most famous brass group." Masters of concert presentations, Canadian Brass has developed a uniquely engaging stage presence and rapport with audiences. Each of its concerts shows the full range of its expertise, from trademark Baroque and Dixieland tunes to new compositions and arrangements created especially for the ensemble, from formal classical presentation to music served up with lively dialogue and theatrical effects. The varied Canadian Brass repertoire features brass standards as well as a wide-ranging library of more than 600 original arrangements. 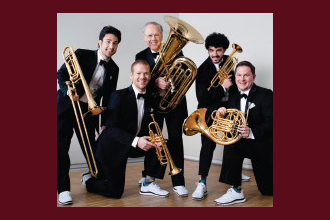 With a discography of over 130 albums, including several videos and an extensive worldwide touring schedule, Canadian Brass continues to score Billboard chart positions. It is an important pioneer in bringing brass music to mass audiences everywhere throughout the U.S., Canada, Japan, and Europe. It has toured South America, the Soviet Union, the Middle East, and Australia. It was the first brass ensemble from the West to perform in the People's Republic of China, as well as the first brass group to take the main stage at the venerable Carnegie Hall. Exclusive artists for Conn-Selmer Musical Instruments, the five play on state-of-the-art 24K gold-plated Artisan Bach and Conn horns, hand-crafted in the U.S. Canadian Brass records for Opening Day Entertainment Group (Odeg), and its sheet music (published with Hal Leonard Corporation) and recordings are available in its online store at www.canadianbrassstore.com. With four decades of performances, Canadian Brass continues to thrill audiences around the world. Tickets are $35 for adults and $18 for seniors and children under 12. To purchase tickets, call 914-395-4507 or go to www.concordiaconservatory.org. Mar. 23, 2016: The Friends of the Bronxville Public Library present the ensemble Musicora in an afternoon of music inspired by poetry on Sunday, April 3, at 4:00 pm at the library. 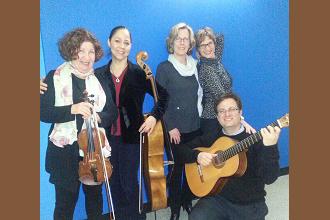 Musicora is a dynamic chamber ensemble consisting of piano, violin, cello, classical guitar, and soprano. The members of this elegant quintet came together from eclectic backgrounds and tastes to form an amazing collaboration, and they perform a diverse repertoire ranging from Mozart to the tangos of Argentina. Their passionate performances are enhanced by the creative changes of instrumentation within their programs. This concert will feature music inspired by poets William Blake, Edna St. Vincent Millay, and e. e. cummings set by well-known composers such as Vaughan Williams, as well as emerging composers Bettina Sheppard and Matthew Baier. The concert is free and will be followed by a reception. Pictured here: The chamber ensemble Musicora.